A couple of years ago I added some reinforcement to my Gibson B45 12-string guitar. A JLD Bridge Doctor was part of the fix, but yesterday it broke. I'm not sure why...I had medium weight strings and had the guitar tuned down a fourth. The tension was really too sloppy, rather than too much. Here is a link to a series of pics snapped during the project. 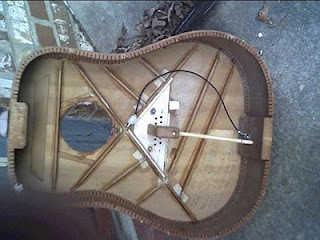 The JDL Bridge Doctor is that piece that goes from under the bridge to the tail of the guitar. I really like the sound of this guitar. It is unlike my Taylors in that there is very little mid-range or sparkle. Very old-fashioned (think 1930's era). I expect to open it back up and do some more surgery. I'm thinking of attaching a permanent piece to the underside of the maple triangle and bridge back to the tailpiece but using solid, non-adjustable thing-a-ma-jigs. I haven't worked out the details yet. But the JDL didn't keep the top straight and it was very hard to keep in tune as the bridge see-sawed from playing. I'm also wondering about making the top two courses be single strings. It seems odd that 4 courses are octaves and two courses are unisons. Doesn't make sense. It's harder to play tremolo or arpeggio with any speed on a double course. You can buy Bridge Doctors at stewmac.com, among other places. They are simple to install, but you do have to drill a hole in the bridge. 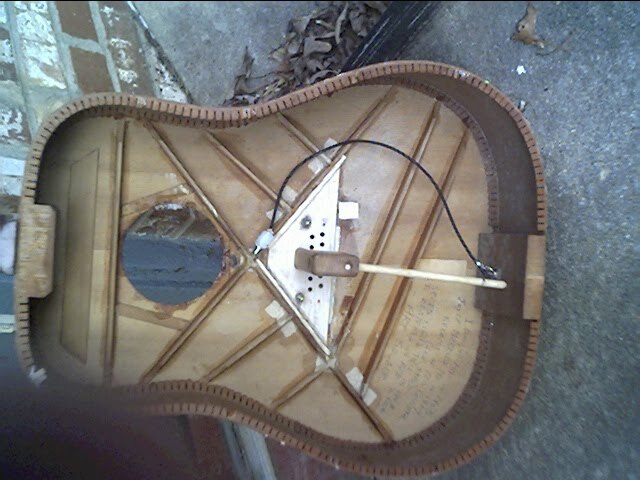 The 1st thing that I notice is that the "truss rod" is at an angle to the "body" of the device. I realise that you had to have the end of the rod at an angle to avoid the pickup jack, but you should also have angled the "body" of the device to keep the "truss rod" and "body" in a straight line. Also, judging from the number of holes, I'm assuming it's a 12 string guitar. The JLD has 2 systems. You should have got the one with brass pins that uses the pin holes instead of a screw through the bridge. Finally, many musicians remove the thinner octave strings on the E & A string, for the reasons you mention.